The Fort McMurray fire, climate change, and our fossil-fuel–powered society. The Fort McMurray fire comes from the collision of free-burning flames with a fossil-fuel–powered society. A convoy of evacuees drives south as flames and smoke rise along the highway near Fort McMurray, Alberta, on May 6. The images are gripping. Horizons glow with satanic reds squishing through black and bluish clouds, as though the sky itself were bruised and bleeding. Foregrounds bristle with scorched neighborhoods still drifting with smoke and streams of frightened refugees, a scene more commonly associated with war zones. But we’ve seen this before. Big fires are big fires, and one pyrocumulus can look pretty much like another. Communities with homes burned to concrete slabs, molten hulks of what once were cars alongside roads, surrounding forests mottled with black and green— these are becoming commonplace. What strikes me most about the Fort McMurray, Alberta, images is the mashup of foreground and background, the collision of free-burning flames with a fossil-fuel–powered society. The first form of burning dates back to the early Devonian, when life first colonized the continents. The second tracks the Anthropocene, when humanity changed its combustion habits and wrenched the Earth into a new order. At places like Fort McMurray the deep past and the recent present of fire on Earth rush together with almost Shakespearean urgency. The plot is old, the stage setting and cast of players updated. Monster fires are no stranger in the boreal forest. It’s a fire-ravenous biota that burns in stand-replacing patches. This is not a landscape where misguided fire suppression has upset the rhythms of surface burning and catapulted flames into the canopy. They’ve always been in the canopy and everything has adapted accordingly. White and black spruce and jack pine and aspen experience exactly the kind of fire they require. How big those patches get depends on how dry the fuel is, how brisk the winds, and how extensive the forest. 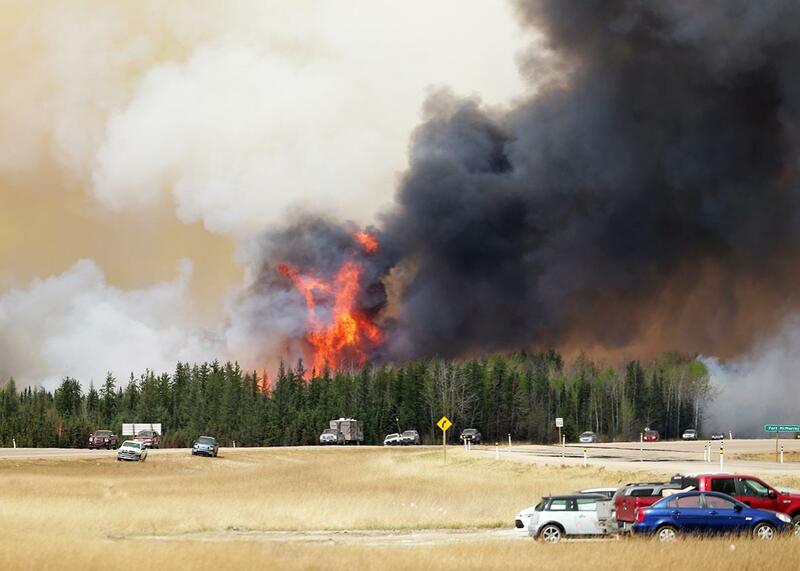 In northern Alberta there is not much to break a full-throated wildfire. The Chinchaga fire started on June 1, 1950, and burned across northeastern British Columbia and most of Alberta until Oct. 31, a total of 3 million acres. That single burn was embedded in a larger regional complex that probably summed 4.8 million acres. Comparable fires date back as far as we care to look. Nor is a burning city a novelty. In North America the wave of settlement in the 18th and 19th centuries paralleled a wave of fire. The surrounding lands were disturbed, and frequently alight with both controlled and uncontrolled fires. The towns were built of wood—basically, reconstituted forests. The same conditions that propelled fires through the landscape pushed them through towns. Only a century ago did those urban conflagrations finally quell as urbanites turned to less combustible materials; fire codes and zoning regulations organized buildings in ways that discouraged spreading flames; fire services acquired the mechanical muscle to halt blazes early; and the wave of settlement flattened. Over the past century modern cityscapes have needed earthquakes or wars to overcome those reforms and sustain conflagrations. Then, they began to return as a broadly rural scene morphed and polarized into an urban frontier of wildlands and cities that faced one another without intervening buffers. The middle, working landscapes, like the middle, working classes, shriveled at the expense of the favored extremes. In 1986 the term wildland-urban interface appeared. It was a clumsy, dumb phrase, but it referred to a dumb problem. Watching houses and then communities burn was like watching polio or plague return. This was a problem we had solved, then forgot to—or chose not to—continue the vaccinations and hygiene that had halted its terrors. Initially, the problem appeared as a California pathology. But it soon broke out of quarantine and has spread across western North America. The prevailing narrative held that the problem was stupid Westerners building houses where there were fires. Most of the vulnerable communities, however, are in the southeastern U.S., and if climate change modelers are correct, we will see the fires moving to where the houses are. That will make it a national narrative. In truth, the problem is international, each country with its own quirky combination of fire-quickening factors. Mediterranean France, Portugal, Greece, South Africa, and Australia are experiencing similar outbreaks. North America has no monopoly. It’s tempting to appeal to climate change as the common cause. Yet the burning bush and scorched town are joined not just by global climate change, but by a global economy, and behind both, by a global commitment to fossil-fuel firepower. That makes the issue both more pervasive and, paradoxically, more amenable to treatment. It means that, while there is one grand prime mover, there are many levers and gears. Fire is a reaction that takes its character from its context. It’s a driverless car barreling down the road, synthesizing everything around it. The enduring images of the Fort Mac fire may, in fact, be its cars. Car-propelled flight, cars stranded for lack of gas, cars melted in garages, evacuation convoys halted due to 60-meter flames, relief convoys laden with gasoline. It isn’t only what comes out of the tailpipe that matters but how those vehicles have organized human life in the boreal. The engagement (or not) with the surrounding bush. The kind of land use that cars encourage. The kind of industry that must develop to support those cars. The kind of city that such an industry needs to sustain it. The oil sand industry that has shaped the contours of modern Fort McMurray is in turn shaped by the internal-combusting society it feeds. So there are really two fires burning around and into Fort McMurray. One burns living landscapes. The other burns lithic landscapes, which is to say, biomass buried and turned to stone in the geologic past. The two fires compete: one or the other triumphs. At any place the transition may take years, even decades, but where the industrial world persists, its closed combustion will substitute for or suppress the open flames of ecosystems. The wholesale transition from the realm of living fire to that of lithic fire may stand as a working definition of the Anthropocene. Once parted they rarely meet. At Fort McMurray they have collided with unblinking brutality. Wild fire burned away controlled fire. The old fires have forced the power plants behind the new ones to shut down and their labor force to flee. It’s like watching an open pit mine consume the town that excavates it. It’s tempting to regard the incident as a one-off, a freak of a remote landscape and a historical moment. But those collisions are becoming more frequent. We have in truth been burning both ends of our combustion candle, and if its light seems more lurid than lovely, there are yet texts to be read in the awful splendor of its illumination.